Whilst visiting my parents in North-West England we managed to also spend a few days in the idyllic Peak District in Derbyshire. My cousin very kindly offered his farm for us to stay. Say no more, we took him up on this and had a wonderful time there. I drove down, another challenge after driving in the US for the last 25 years, especially with really narrow, winding roads where the speed limit was a crazy 60mph. I couldn’t possibly go at that speed so a few cars drove exceedingly close behind me making me feel ancient. The farm, located near Buxton, was beautiful, with loads of room and rooms. There were also bottles of wine, beer and a basket of fruit. (I hope it was for us!). Our daughter was in her element choosing a bedroom and seeing all the dairy cows. Summer can be especially hard if you are a landscape photographer and it is even more difficult if you are visiting England. Late sunsets and early sunrises leave you with little sleep, especially when you also have family activities in the day. “Deal with it!” I hear you say, so I did! We were there for 5 days so I tried to get out as much as I could for the good light. One location I had read about was Stanage Edge which is a 4 mile long gritsone edge which overlooks the town of Hathersage. It has many unique rock formations which make perfect foreground elements. I climbed up for one of the first sunrises, arriving before sunrise (4.45am) and the conditions were very windy, with mists and clouds being swept forward soaking me and obscuring any chance of sun. I waited for about two hours up there but there was no sign of it clearing. I left to see what things were like lower down. The light was coming through at lower altitude and I could see in front of me but wasn’t sure where would be best to go. I ended up getting a few shots of the area including this cute horse (for my daughter). I realized later that I should probably have waited it out up on the cliff so I revisited a few days later. I was met with a similar result with whipping winds and thick mist. I arrived at sunrise to find a young couple at the top who had planned to fly a drone to capture the rising sun. They seemed to have the same response I did a few days ago and they left rather than risk a downed camera. 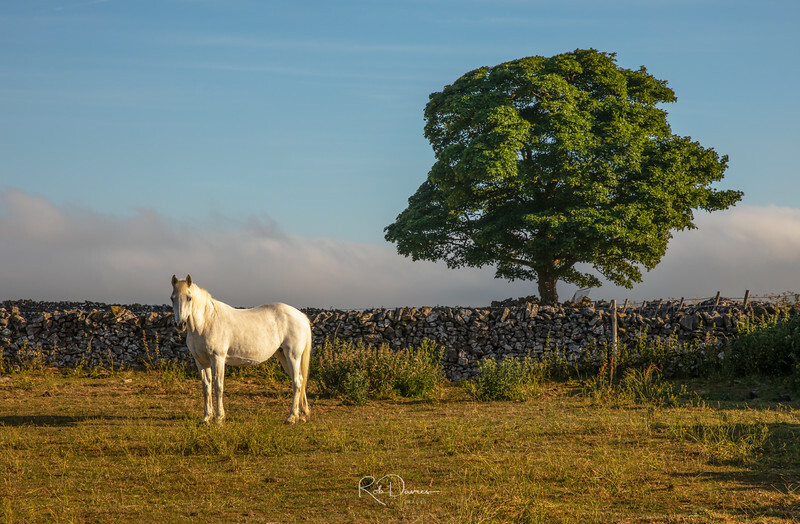 This time I decided to wait out the clouds and mists and was finally rewarded around 7.15am when breaks appeared in the clouds, the sun lighting patches of the dales below. It was a wonderful, rapidly changing view and I had to calm myself as I moved across rocks on the cliff ledge, being careful not to topple over the edge and inadvertently end up as someone else’s foreground element. 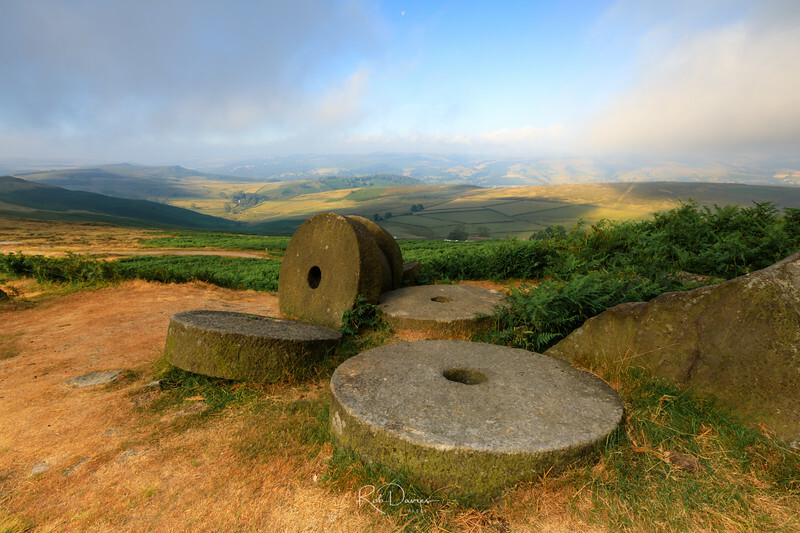 I had wanted to take a picture of the abandoned millstones lower down on the hillside. I made my way down (quickly) and took some shots. This had been my third time of trying. At last I had something I was happy with!